Accuride International, manufacturer of telescopic extension slides, will launch the second generation of Fullpyro, a pyrolytic-compatible telescopic extension slide, in September 2018. The patented rail uses an innovative technology with a solid graphite lubricant and – as communicated by the company – is currently the only rail available for pyrolytic ovens that does not release any detectable emissions after initial heating. The use of this technology also makes it maintenance free and extremely durable. 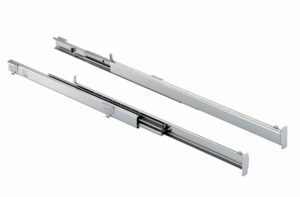 “With over fifty years of design experience – said Laurent Trémolières, Managing Director of Accuride – we have unique expertise in the field of telescopic extension rails. 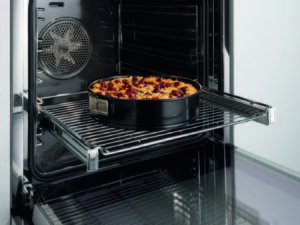 This has enabled us to develop the special pyrolytic-compatible oven rail, which has never been available on the market in this form before and offers users decisive advantages”. Pyrolytic ovens have special programs for cleaning by heat. During pyrolytic process, by heating the oven to very high temperatures – up to 500 degrees Celsius –, impurities are burned away inside the oven. There is no need for tedious manual cleaning, or the use of chemicals with “oven sprays”. However, only few internal parts are so heat resistant and can remain in the oven at this extremely high temperature during cleaning. Therefore, most oven rails need to be removed from the oven before the cleaning process starts and be cleaned separately by hand. Instead, with the technology proposed by Accuride the rails can be cleaned during the pyrolytic process of the oven. The Fullpyro is a pyrolytic rail without grease as lubricant. It does not require re-greasing and is therefore maintenance free. Accuride uses a solid lubricant made of spherical graphite elements. A special ball cage geometry has been developed in which balls and graphite elements generate optimal friction and thus ensure consistently good lubrication over the entire service life. As a result, the rail runs very quietly and easily. Even after many cleaning processes, the Fullpyro remains smooth in its running characteristics. 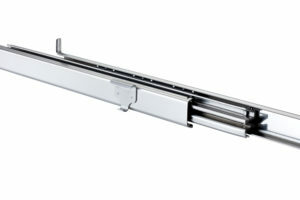 Due to the solid lubricant used, the user does not have to fear contamination by lubricating grease when removing the ash after the cleaning process, unlike other conventional pyrolytic rails. Besides, due to the technology used, fewer odours are produced during the initial commissioning, which would otherwise be caused by grease evaporation in the rails. After the first cleaning cycle, the Fullpyro is free of detectable emissions. A test by the Technical Control Board TÜV has confirmed that formaldehydes or toxic gases no longer occur after initial operation during the pyrolytic clean. Finally, the Fullpyro is suitable for the dishwasher. Depending on the degree of contamination, small amounts of dirt may still be present in the gaps after pyrolysis. In this case, the Fullpyro can be cleaned quickly and easily in the dishwasher. The last small dirt in the interior of the rail is completely removed. There is no need for separate manual cleaning.